Due to housing problems, Zeus is looking for a new home where he can receive lots of love & cuddles, nice long walks and plenty of company. He is happy to go to dog friendly areas and enjoys being off lead, however he prefers to make dog friends on his own terms and with dogs of a similar size. 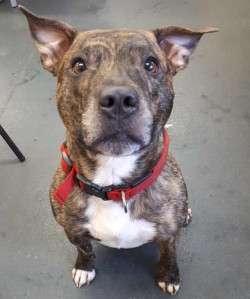 Currently still in his home, Zeus hates to be alone for long periods and finds kennel life stressful, therefore he is waiting at home for the right family to come along. He is a super friendly staffy who prefers a quieter life and doesn’t like too much noise or goings on. He would prefer a stable routine and to have someone home most of the time to give him the attention he deserves.